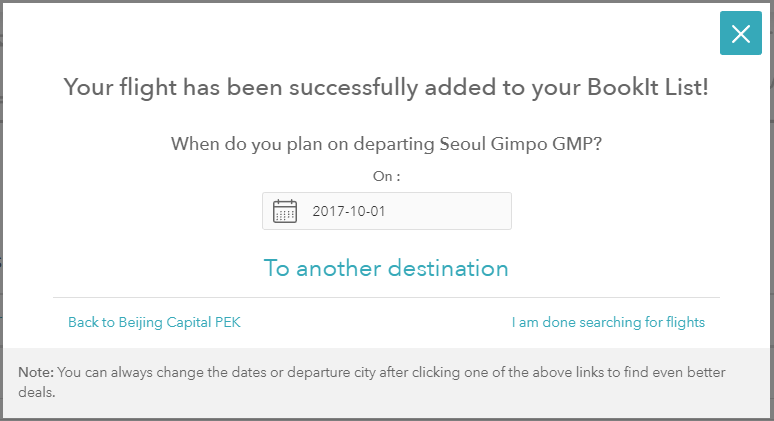 In this blog entry, you’ll learn how to use the online airfare deal finder tool SkySurf.Travel to build the most economical travel itineraries to travel around East Asia by plane (or anywhere around the world). 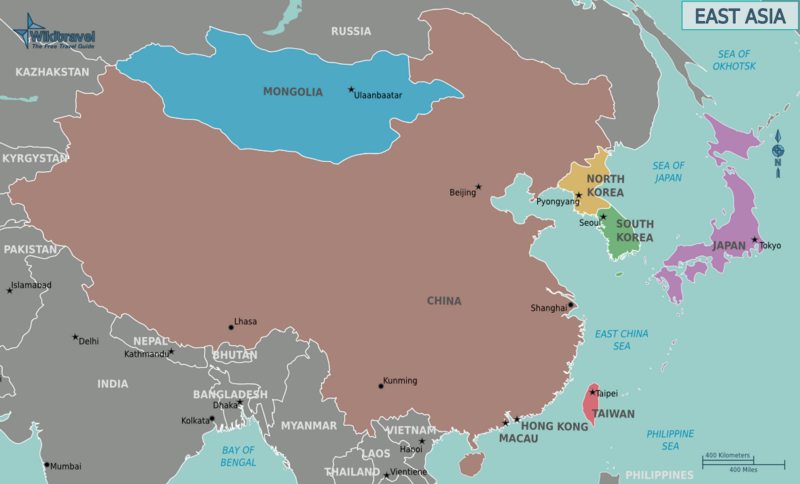 East Asia, also popularly known as “the Far East,” is home to about 1.6 billion people. The region contains world metropolises such as Hong Kong, Tokyo, Seoul, and Shanghai, endless archipelagoes at the edge of the Pacific Ocean, as well as vast plains and sky-high mountains. Mount Fuji – Iconic snow-topped volcano, and highest peak in Japan (3776 m). Plane travel is the fastest way to travel between countries in East Asia, as well as long distances within them. Plane travel within East Asia tends to be cheap by Western standards. 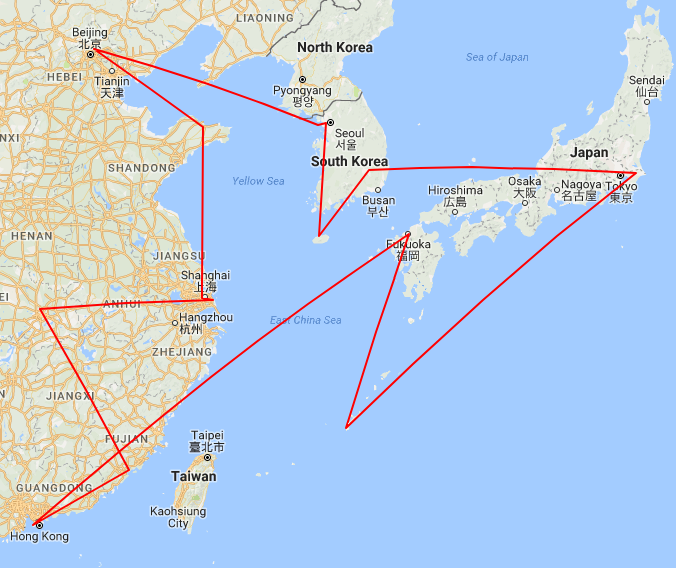 In this example, you’ll learn how I was able to build an East Asian flight itinerary to 12 cities (3 countries) for under $750 using SkySurf.Travel! Keep in mind, when building your own custom flight itinerary at SkySurf.Travel, prices may vary. Flight prices change on a daily basis, so building the exact flight itinerary used in this example will not work. You might get an even better deal than the one used in this example, or slightly more expensive, depending on the time you build your flight itinerary and travel route. If you need assistance building a cheap travel itinerary, you can chat with our friendly online support, which can be found on the bottom right corner of the SkySurf.Travel homepage. If live support is offline, you can leave a message and we’ll reply to you as soon as possible. That’s a total of 12 cities (3 countries). I first clicked on the “Multi-city” tab, then entered in “Beijing” in the “Traveling From” input field. Next, I selected “August 2017” to find the cheapest flight departing Beijing, China in August 2017. 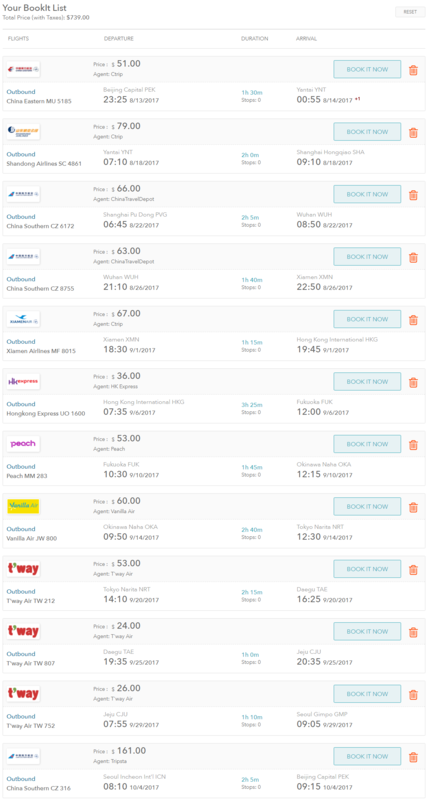 Finally, I clicked on the “Search Best Deals!” button and a list of the cheapest flights were displayed. I decided to stay in Yantai for 4 nights and selected the date August 18, 2017 for my departure. I then clicked on the “To another destination” link and new results appeared. My cheapest option was to Shanghai, China for $79. I added this flight to my itinerary by clicking on the “+Add to BookIt List” button, and repeated the above process until I was back in Beijing, China. Certain countries in Asia require a visa upon arrival. Be sure to do your research before booking flights to Asia. You may need to apply for a visa before arriving in China. Citizens of some countries, such as Bahamas, San Marino, Serbia, Fiji, Ecuador, and Barbados do not need a visa to enter China. East Asia is one of the cheapest places on Earth for travelers — with lodging and food offered at very low prices, particularly for long term travel or for those willing to stay somewhere other than the big resort. East Asia has something for everyone and continues to lure thousands of backpackers to its beautiful lands and people year after year.